The report covers the analysis and forecast of the Advanced Telematics in Trucks market on global as well as regional level. The study provides historic data of 2016 along with the forecast for the period between 2017 and 2025 based on revenue (US$ Mn). 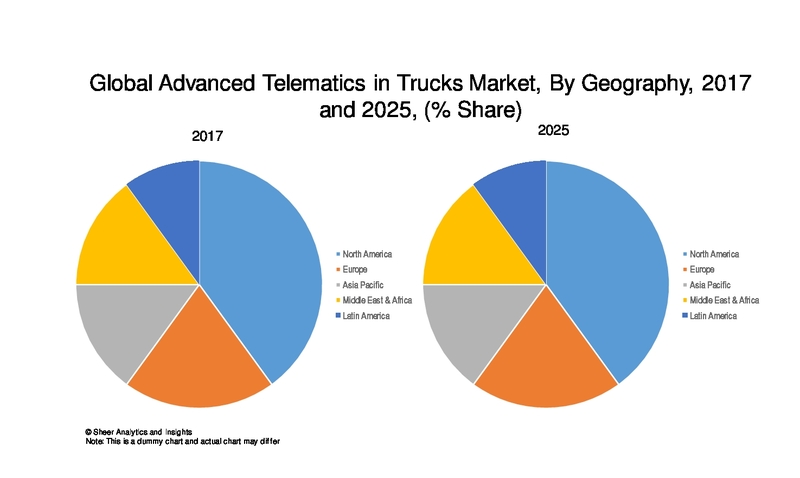 The study provides a detailed view of the advanced telematics in trucks market, by segmenting it based on provider, application, industry verticals and regional demand. In automotive industry, there are various services facilitated by telematics equipment such as fuel management, driver behavior, journey analysis, vehicle diagnostics, vehicle tracking, GPS and navigation, vehicle theft tracking, internet connectivity and others. Advanced telematics in trucks offers a communication pathway between the driver and the dispatcher. Advanced telematics technology combines location technology (Global Positioning System or GPS), onboard computing, and other communication technology that helps in creating a massive potential market for various applications and most of the automotive companies to adapt the technology by 2025. The competitive profiling of the key players in the global Advanced Telematics in trucks market across five broad geographic regions is included in the study. These include different business strategies adopted by the leading players and their recent developments, as in the field of telematics in trucks. A comprehensive analysis of the market dynamics that is inclusive of market drivers, restraints, and opportunities is part of the report. Additionally, the report includes potential opportunities in the Advanced Telematics in Trucks market at the global and regional levels. Market dynamics are the factors which impact the market growth, so their analysis helps understand the ongoing trends of the global market. Therefore, the report provides the forecast of the global market for the period from 2017 to 2025, along with offering an inclusive study of the Advanced Telematics in Trucks market. The report provides the size of the Advanced Telematics in Trucks market from 2016 and the forecast for the next nine years up to 2025. The size of the global Advance Telematics in Trucks is provided in terms of revenue. Market revenue is defined in US$ Mn. The market dynamics prevalent in North America, Europe, Middle East and Africa, and Asia Pacific have been taken into account in estimating the growth of the global market. The Market estimates for this study have been based on revenue being derived through regional pricing trends. Demand for Advanced Telematics in Trucks has been derived by analyzing the global and regional demand for advanced telematics in each application for its respective functions. The Advanced Telematics in Trucks market has been analyzed based on expected demand. Forecasts have been based on expected demand from Advanced Telematics applications. We have used the bottom-up approach to estimate the global revenue of the Advanced Telematics in Trucks market, split into regions. Based on provider type, application and function type, we have summed up the individual revenues from all the regions to achieve the global revenue for Advanced Telematics in Truck. The application split of the market has been derived using a bottom-up approach for each regional market separately, with the global application segment split being an integration of regional estimates. Various Companies were considered for the market share analysis, based on their innovation and application and revenue generation. In the absence of specific data related to the sales of Advanced Telematics in Trucks several privately held companies, calculated assumptions have been made in view of the company’s penetration and regional presence across all applications. The report covers a detailed competitive outlook that includes the market share and company profiles of key players operating in the global market. Key players profiled in the report include Qualcomm Inc., Aether Systems Inc., Masternaut, People Net Communications Corp., and Daimler Fleet board GmbH. Advanced telematics in trucks is the science of informatics and telecommunications that is being applied in computational systems and as well as in wireless technologies. Advanced telematics technology is a modern version of telecommunication, road transportation and vehicle technology which has massively impacted vehicle’s navigation system for generations, and is likely to augment the demand of the technology throughout various automotive verticals. The telematics equipment offers different features that make a vehicle smarter. Advanced telematics in trucks offers a communication pathway between the driver and the dispatcher. Information is being sent to a central server from the truck, from where the dispatcher gains access about the truck location. Exception alerts are also present to notify the dispatcher when the truck leaves a limited geographic area. Advanced telematics provided in trucks helps to improve the efficiency of an organization. Advanced Telematics in Trucks offers wide range of benefits to stakeholders and fleet operators. These benefits may include tracking of trucks which offers better security, greater work productivity, lower maintenance cost of trucks through remote vehicle diagnostics and others. Market of ‘advanced telematics technology’ in trucks is still at a very nascent stage in some regions and with a billion dollar investments in research and development of applications throughout various automotive industry verticals, market growth of advanced telematics has a very high potential. Advanced telematics technology combines location technology (Global Positioning System or GPS), onboard computing, and other communication technology that helps in creating a massive potential market for various applications and most of the automotive companies to adapt the technology by 2025. Major applications of advanced telematics technology covered in report are Trailer tracking, Vehicle tracking, Container tracking, Cold store, Satellite navigation, Wireless vehicle safety communications, and vehicle mileage capture. The report has been segmented by truck type into four different categories such as light trucks, medium trucks, heavy trucks and off-road trucks. In automobile industry, advanced telematics in trucks is a futuristic technology with its capacity to monitor vehicle behavior as well as driving behavior and then pass on the information to the user. Telematics technology will be one of the major trends to gain traction in this market in the upcoming years. Telematics system will reduce the probability of vehicle disconnection which occurs due to mechanical failures. The key driver behind growth in telematics system in truck is the importance of vehicle connectivity. New vehicle sales, spare part sales, service or repair are some of the major segments that enable greater value chain coverage. Telematics technology reduces liability and security risks as well. The rise in demand of advanced telematics can increase the demand for automobile which in turn causes the expansion of automobile industry. Some of the major players in the advanced telematics technology market are Qualcomm Inc., Aether Systems Inc., Masternaut, PeopleNet Communications Corp., Daimler Fleetboard GmbH, among others.